The easiest ammunition dollars you’ll ever spend are on .22 long rifle. Whether there is some in stock everywhere or it’s hard to find, there’s always a little extra budget for .22LR. 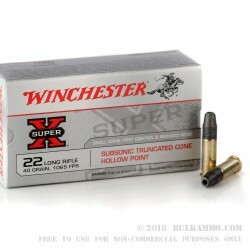 When you need to stock up, the plain vanilla completely middle of the road, Winchester 40 grain Super-X .22LR is a pretty good choice. It’s so good that it might be some of the best .22 LR ammo to buy because it runs the gamut of versatility and the power is enough to function anything; the quality control is excellent and now, with the improved powder mix, the noise level is reduced. It’s essentially like the best .22LR you remember shooting growing up, got some basic quality of life improvements, and now it just works with everything. 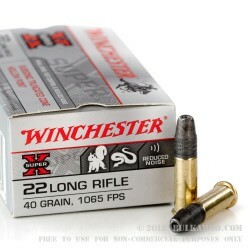 The Winchester 40 grain truncated cone hollow point Super-X load is just an extremely reliable, very solid round. There’s not a lot to say about it except that it’s not a specialty round and it’s not a bargain round, which makes it genuinely awesome, because, gone are the days when you could compare .22 LR ammo and find 20 good offerings in the middle ground. Now there aren’t many left there. This load is just that: .22LR ammo that works in anything, fires accurately and doesn’t cost more than it should. There’s a lot to be said for Winchester pursuing that path with this ammunition for so long.